Now, earlier in the creation of the bracket, I had the #15 seed as another version, which was made in 1983, and whose cover had been used for this film online; however, this film is not that version with Michael Jayston, but rather a modern-dress version with Clyde Sacks. By placing it at #15, I knew that it was going to be a tough match-up. But I didn’t know how tough. Not only is the BBC Complete Works version better than I remember, but this 2006 one is quite frankly horrible. Witches as hackers. Corporations rather than countries. Which wouldn’t be so bad if it paid off, but it didn’t. We see the unseaming from nave to chops is a corporate takeover with a pen and a handshake, but for it then to move to actual violence just doesn’t work. And a kind of frumpy Lady M. But enough with this one. Much better is BBC version. As with most of the series, this one is shot on a soundstage, but it has a much more cinematic feel to it, with almost a painterly color palette. Williamson makes for a solid, physical Macbeth, who spits his lines out, quicker than most–adding to the fast pace of this version–slowing down only for the soliloquies. Lapotaire doesn’t fare quite so well, directed by Gold to lay down for the “unsex me” and writhe through it, touching herself. It’s obviously an aphrodisiac. She’s a sexual Lady Macbeth. But a bit too much. Gold makes some interesting choices. At the banquet, Banquo’s chair is empty, so we see what the thanes are seeing (though it does appear that Lady Macbeth sees the ghost the second time around). 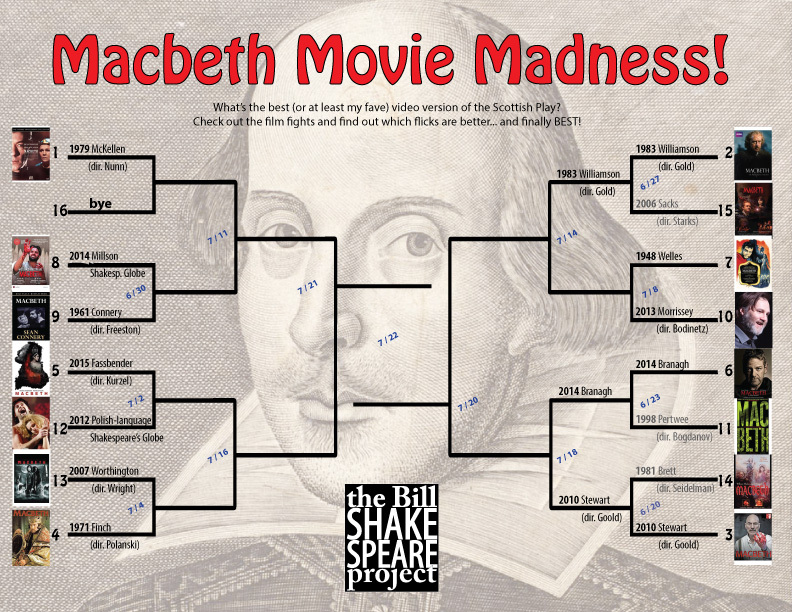 He skips Act Three, Scene Five, and moves Scene Six to the midst of Macbeth’s scene with the witches, with the king interrupting the thanes’ discussion, which continues after he leaves. Not all of the choices work, but they work one heckuvalot better than the ‘06 version. In the end, the BBC moves on to the second round. But first another first-round matchup: 8 vs. 9 — Millson vs. Connery.